The president described congressional efforts as a "waste of time." 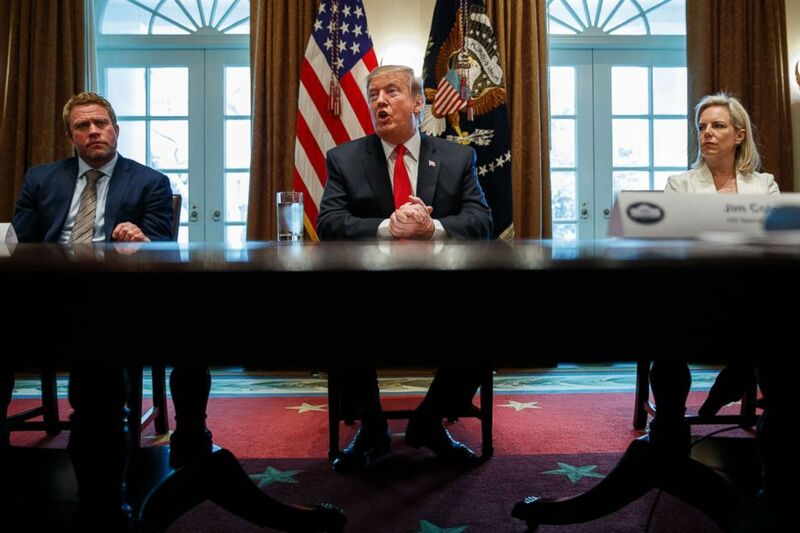 President Donald Trump said Friday there’s a “good chance” he’ll ultimately declare a national emergency to get money to pay for his proposed border wall, continuing to strike a pessimistic tone that congressional negotiators will reach a legislative deal to fund a southern barrier. "I’m certainly thinking about it. I think there’s a good chance we’ll have to do that,” the president told reporters during an extended pool spray of a meeting on human trafficking. While stopping short of saying he's made the decision, he suggested he might reveal more during his State of the Union address on Tuesday. Asked again, he added, "I’m saying listen closely to the State of the Union, I think you’ll find it very exciting,"
The president also reiterated his confidence in the administration’s legal standing for declaring a national emergency, should he decide to declare one. "We're in a very strong legal standing -- we are doing it regardless. We haven't declared the national emergency yet and yet we're building a lot of wall," Trump said. In explaining his reasoning for a potential declaration, the president criticized Democrats, and specifically House Speaker Nancy Pelosi, for continuing to deny him funding for his desired border wall. The president's pessimistic take on the prospects for congressional negotiators to come up with a deal represents a dramatic shift from the tone he struck just a week ago, in announcing the government would reopen for a period of three weeks to allow time for congressional negotiators to craft a deal. (Evan Vucci/AP) Timothy Ballard, CEO of Operation Underground Railroad, left, and Secretary of Homeland Security Kirstjen Nielsen, right, listen as President Donald Trump speaks during an event on human trafficking in the Cabinet Room of the White House, Feb. 1, 2019, in Washington. "Over the next 21 days, I expect that both Democrats and Republicans will operate in good faith. This is an opportunity for all parties to work together for the benefit of our whole beautiful, wonderful nation," Trump said in remarks in the Rose Garden last Friday, announcing the end of a 35-day partial government shutdown. Even as the president continued to make his case about the security situation at the southern border and said that a national emergency option would “help the process” of building his barrier, he also claimed that a wall is already under construction. While some portions of pre-existing barrier on the southern border have undergone renovations, no new wall has been built, as the president claims. In the event focused on human trafficking, the president made the case that building a southern border wall would cause human trafficking to go down by a “tremendous percentage,” making the case that human trafficking is hard to pull off at legal points of entry. “It’s very hard to do human trafficking through ports of entry because you have people standing there saying hey what’s going on in the backseat, what’s going on in the trunk. They check these things. So they come into areas where you don't have the barriers,” Trump said. But the president’s statement misrepresents the reality that the majority of cross border human trafficking does in fact flow through legal points of entry. According to the Human Trafficking Legal Center, most foreign-born human trafficking victims enter the United States with legal visas believing they will be given a chance to work legitimate jobs. Others may cross illegally with the hopes of finding work in the U.S., only to be trafficked into forced labor once they’ve crossed the border. ABC's Quinn Owen contributed reporting.